Announce your drink menu or entertain guests with these chalkboard coasters. 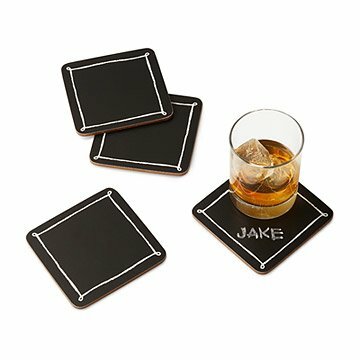 Whether it's an intimate wedding reception or a casual happy hour, make your event truly unique with these chalkboard coasters. Announce a special cocktail, bottle of wine, craft beer tasting, party theme, or your guests' names. You can also set your company up with their own pieces of chalk (not included) to encourage doodling or to play games between rounds. Each coaster is backed with non-slip padded cork to protect surfaces. Set of 4. Made in China. I haven't used them myself as they were purchased as a gift. Even if there are flaws, the concept and price make them a unique gift that you can use to supplement a bottle of wine. I bought this for a friend's housewarming, and it was a great gift! She's a teacher, so the blackboard theme worked out well and the ability to chalk the coasters is a lot of fun. Great host/hostess gift. Fun and practical. Helps guests keep track of their drinks... fewer extra glasses to clean. We've been collecting bottle caps from breweries all over the US in a jar and now we can actually do something with them. My husband loves it!